A February photo shows former Virginia Governor and U.S. Sen. George Allen, right, talking with supporters during a stop in Bristol, Va. Allen was on a five-city town hall tour of Virginia to discuss the need for nonpartisan and transparent redistricting reform. States around the country are taking the process of creating political districts out of the hands of politicians. In the past decade, eight states have overhauled their redistricting procedures to lessen the potential of partisan manipulation, including four that adopted ballot measures last fall. 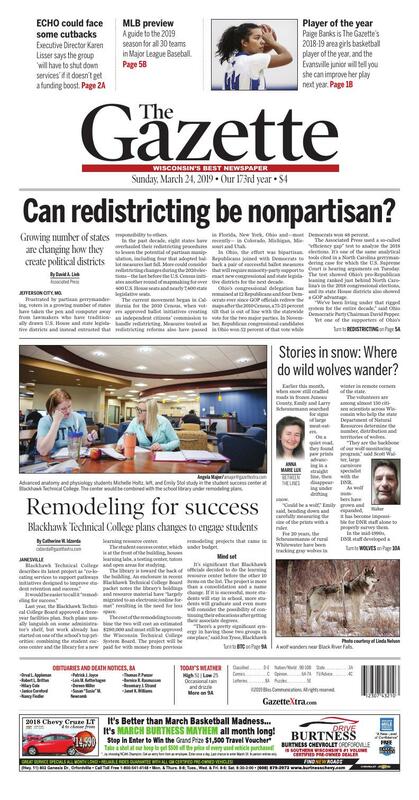 More could consider redistricting changes during the 2020 elections—the last before the U.S. Census initiates another round of mapmaking for over 400 U.S. House seats and nearly 7,400 state legislative seats. The current movement began in California for the 2010 Census, when voters approved ballot initiatives creating an independent citizens’ commission to handle redistricting. Measures touted as redistricting reforms also have passed in Florida, New York, Ohio and—most recently— in Colorado, Michigan, Missouri and Utah. Yet one of the supporters of Ohio’s new redistricting procedures is Republican Secretary of State Frank LaRose, who worked as a state senator to refer the measures to the ballot. LaRose said he hopes the new process leads to more competitive elections—even if that puts Republicans at risk. Advanced anatomy and physiology students Michelle Holtz, left, and Emily Stol study in the student success center at Blackhawk Technical College. The center would be combined with the school library under remodeling plans. Student Cheyenne Waddington uses a laptop in the student success center at Blackhawk Technical College. Last year, the Blackhawk Technical College Board approved a three-year facilities plan. Such plans usually languish on some administrator’s shelf, but work already has started on one of the school’s top priorities: combining the student success center and the library for a new learning resource center. The student success center, which is at the front of the building, houses learning labs, a testing center, tutors and open areas for studying. The library is toward the back of the building. An enclosure in recent Blackhawk Technical College Board packet notes the library’s holdings and resource material have “largely migrated to an electronic/online format” resulting in the need for less space. The cost of the remodeling to combine the two will cost an estimated $280,000 and must still be approved the Wisconsin Technical College System Board. The project will be paid for with money from previous remodeling projects that came in under budget. It’s significant that Blackhawk officials decided to do the learning resource center before the other 10 items on the list. The project is more than a consolidation and a name change. If it is successful, more students will stay in school, more students will graduate and even more will consider the possibility of continuing their educations after getting their associate degrees. First the obvious: Student who go to tutoring do better in school. Students who visit the research librarian do better on their papers. Now the unexpected: Students who visit the research librarian are three times more likely to return to school the next semester. It’s not just about the librarian, it’s about students becoming more a part of an institution. “The most interesting piece is that when you have engagement outside the classroom, the students become more engaged with their work, more engaged with the belief in themselves and more engaged with the idea of themselves as a graduates,” Tysse said. Tysse pointed to the work of Vincent Tinto, a sociologist whose specialty is student retention and learning communities. In a September 2016 essay in “Inside Higher Education,” Tinto wrote about the qualities students need to graduate successfully. It’s a quality that’s learned, and unlike self-confidence, it can vary from task to task. Another is a sense of belonging. That’s what Tysse sees happening here. The Blackhawk Technical College Board in 2018 approved a three-year facilities master plan. The plan is flexible and dependent are how much money is available. At the top of the list is relocation of the school's center for transportation studies, which is now located near the corner of Highways 14 and 51. That project is dependent on the sale of the building. 1. Consolidation of the student success center, library and advising into one location. Phase two of this project will involve establishing a “University Center” with representatives from colleges Blackhawk has transfer agreements with such as UW-Whitewater. 2. Outdoor training track. Land for this project was purchased last spring, but funding limitations will require a multi-year, phased approach to construction, according to college documents. The track would be used by law enforcement and fire science training, commercial truck driver training and motor cycle driver training. 3. Integrating student support services. The fitness center, conference room and possibly another classroom will be opened up for easy access from advising and admissions to the courtyard and learning resource center. 4. College commons/cafeteria. Remove the wall separating the commons from the back corridor to let in more natural light. 5. Additional accessible parking and a building entrance near the commons to increase access for students and visitors. 6. Courtyard improvements. Create tiered levels with comfortable seating, install sail awning for shade and expand recreational opportunities. 7. Culinary expansion. Establish a second kitchen for the culinary program and create a window view from the hall into the culinary lab. 8. Meeting rooms. Combine several rooms and add a view and access to the courtyard. 9. Remodel the former HVAC wing into support for the EMT program and for administrative offices. 10. Use the northwest lower level wing for the expansion of the Rock University High School, a charter school of the Janesville School District. 11. Remodel the library into a student recreation and sports center. Stories in snow: Where do the wild wolves wander? Larry and Emily Scheunemann of rural Whitewater have been helping the state Department of Natural Resources track wolves in Wisconsin for 20 years. A wolf wanders near Black River Falls. Emily and Larry Scheunemann found these wolf tracks in their neighbor’s garden in rural Whitewater. Two wolves walked in a straight line, leaving behind tracks two winters ago in Marquette County. Earlier this month, when snow still cradled roads in frozen Juneau County, Emily and Larry Scheunemann searched for signs of large meat-eaters. For 20 years, the Scheunemanns of rural Whitewater have been tracking gray wolves in winter in remote corners of the state. To become a volunteer tracker or learn more about it, visit dnr.wi.gov/topic/wildlifehabitat/volunteer.html. Evansville’s Paige Banks keeps the ball away from a Whitewater defender during a Rock Valley Conference game Tuesday, Dec. 11, 2018, at Evansville High.